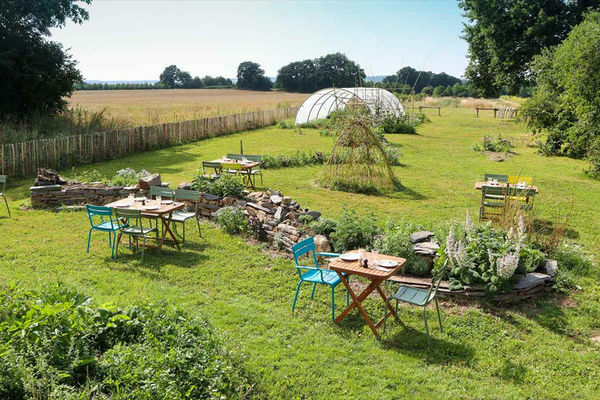 At Sixt-sur-Aff, near La Gacilly and Saint-Just, La Table de l’Amante Verte is reinventing the art of infusion and the botanical garden. In this peaceful retreat, which is a café, bookshop and garden, you can enjoy sensory delights that you won't find anywhere else. Do you prefer our Ardente blend or our Alchimie mix? Near Redon, the citizens’ farm known as 'L’Amante Verte' produces 100%-organic infusions of outstanding quality. Picked by hand and dried at a low temperature, they include verbena, camomile, bergamot, basil and many more. They are blended and matured just like grand cru wines. In order to share their passion, Claire and Adrien created La Table de l’Amante Verte, a friendly, gourmet café-bookshop-garden that is open to everyone. The former stone-built stable and its vast garden are surrounded by fields and are an ideal place for a stroll. The golden rules of the place are: sniff, taste, touch and then …let yourself go! Depending on the season, there are various sessions where you can try out the unique taste of the plants. After a botanical walk, you can join in a gourmet workshop or a tour of the garden via the herbalist’s shop – our 'treasury. We're willing to bet that you’ll never buy herbal teas in tea bags again!